Graeme White: "the other driver (partly hidden) is Tim Schenken." Viv Paine: "The pic of Allan Moffat in the 3A chasing Rocky Tresize in the MGA was taken at Calder Raceway 24 February 1963. My maternal grandfather used to work for Allan's father who was a senior executive at Massey-Ferguson in Sunshine, Melbourne. The M-F connection is why Allan's father assisted him with the deposit for the 3A. Allan claimed it was the fastest TR in Victoria but arguably the powder blue 3A Harry Firth built for Gavin Baillieu was quicker (Allan can rightly claim to being the quickest TR driver in Victoria). The Baillieu 3A was later very successfully campaigned for many years by TR Register member Gerry Lawson who owns it to this day. On the other hand Allan Moffat's 3A disappeared after he returned to Canada in 1964, whereabouts unknown to this day." Graeme White: "A young Allan Moffat did kick start his interest in motor sport in a mighty Triumph TR3A here in Victoria, and not like others in an MG. 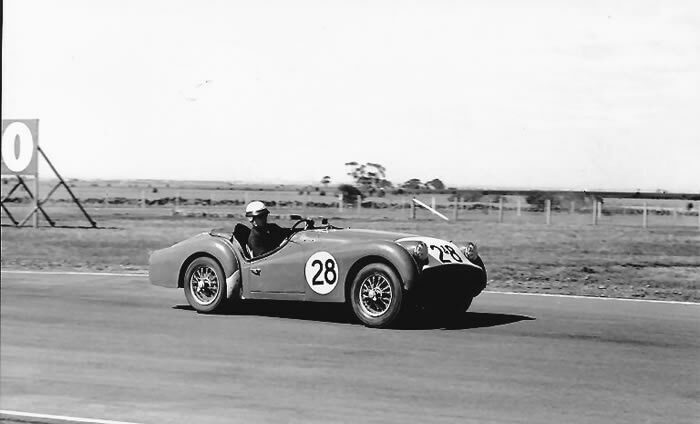 Here is a photograph of Allan Moffat’s first ever trophy that he was presented at a “closed”club meeting, conducted by the AMSC – the Australian Motor Sports Club, when driving his red, Triumph TR3A roadster at Calder Raceway in Victoria. Allan developed a great yearning and passion for motor sport, through his membership with the Triumph Sports Owners Association, Melbourne Branch, as well as the Australian Motor Sports Club here in Melbourne . It is interesting to note, that his TR3A was reported to be on hire-purchase (!) but that did not stop a young Allan from competing in as many week-end club events or more challenging open class events. 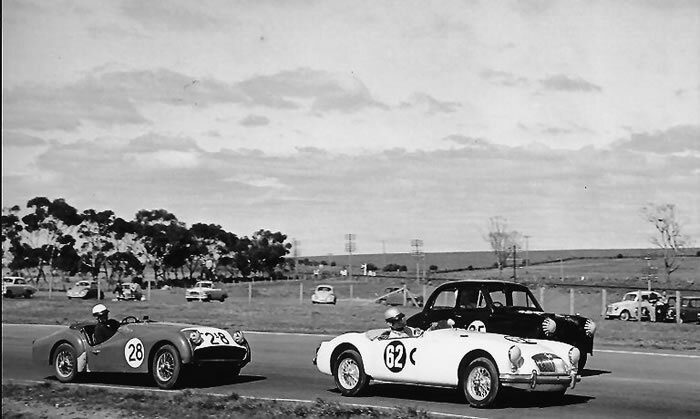 Allan obtained his probationary CAMS competition licence during 1962 which brought him much enjoyment and excitement in events during 1962 and 1963 at circuits across Victoria. The whereabouts of Allans red TR3A is unknown today, having been known to still exist, in late 1973, at an address in Flemington Road, West Parkville, Melbourne, Victoria." 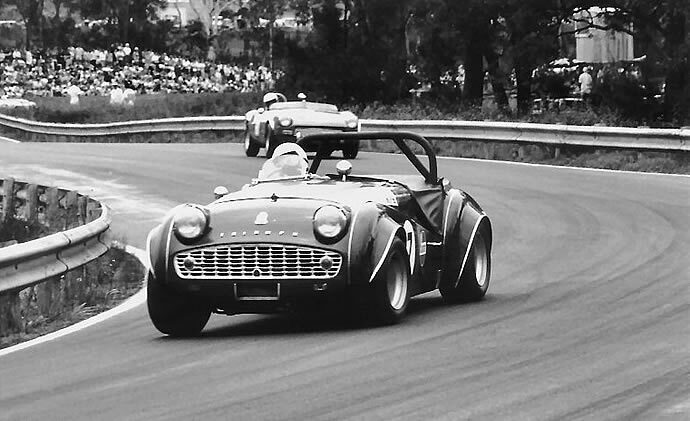 Below: Bruce Tompson: "My TR3a followed by Graeme Laurie's spitfire in the esses at Warwick Farm about 1969. My old car is now raced by Andrew Gibson." "TR3A Reg DRK-421 with an early ocky strap was raced at Warwick Farm and Oran Park during the mid to late 60's by D Scott. There's a start for you. He was most probably linked with Ecurie Triumph so there may be more to know, like what was his first name?" The DEFINITIVE ANSWER has been provided by viewer Rod Chivas (March 2018). 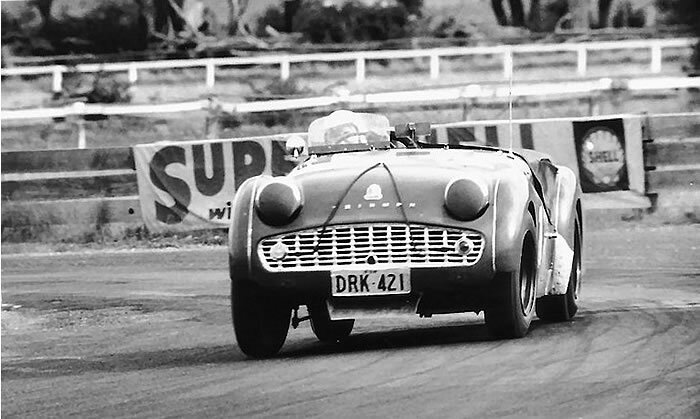 The photo is of Darryl Scott's TR3A at the Towac circuit near Orange in 1965 ... thanks Rod. "I vaguely remember a D. Scott and think it might have been Don. I do remember Ecurie Triumph. Aside from Bruce Thompson, there was Bob Cox who had an orange TR. May have been a 2 or 3. Also Jim Neal who had an iridescent bright blue TR. I think Harry Cape with the GT6 was also part of that group and maybe Bob Woods who had a Spitfire. At the same time there was a Leyland team with Graeme Laurie (Spitfire), Ross Bond (Healey), a Doctor from Newcastle (can’t remember his name) who had an MGB, and I think Graham Bland with a Sprite." He says: "...following on from Neville Turbitt’s comments re the ‘Leyland Team’, the Doctor driving the MGB would have been Dr Ian Corneiss with his twin cam (from an MGA) MGB. Quite a well known car and since restored and back working again, I think. It was blue in colour with flared guards." Rick Fletcher - "I think it's intriguing how so much information has been extracted from these photos by means of input from club members and viewers. It's just small bits of sporting history being preserved but it extends our records on TRs in Australia."